Usman Khawaja and Cameron Bancroft walk off after sealing Australia A\'s win against India A in the 2nd unofficial Test at Chennai on Saturday. 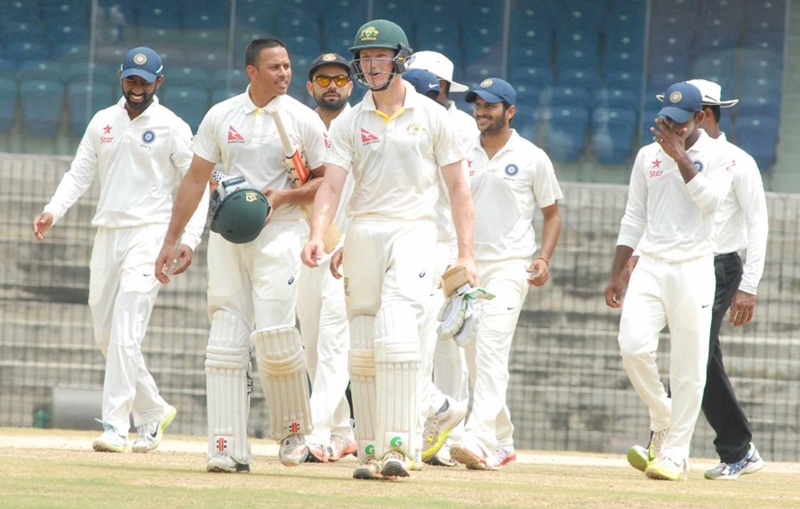 Australia A wrapped things up quickly to canter to a 10-wicket win in the fourth and final day of the second unofficial 'Test' against India A at MA Chidambaram Stadium in Chennai on Saturday (August 1). With this win, the visitors won the two-match series 1-0. Starting the day on 267 for 6, India added just seven runs before they folded for 274 in 88.3 overs to set the visitors a target of 61. In reply, Cameron Bancroft and Usman Khawaja, the openers, went hammer and tongs right from the beginning to reach the target in just 6.1 overs. Khawaja was particularly aggressive, scoring 41 off 23 in an innings that saw seven hits to the boundary and one over it. Bancroft, fresh from a match-winning 150 in the first innings, played a perfect second foil in this short chase to end with 21 off 14. Earlier, Gurinder Sandhu and Steve O'Keefe collaborated to pick the remaining wickets and ended with four wickets each in the second innings. Shreyas Gopal was the first wicket to fall, caught by Bancroft off Sandhu's offspin. Sandhu then got rid of Varun Aaron (1) and O'Keefe completed the formalities when he had Shradul Thakur (4) caught by Joe Burns. Things were looking bleak for the home side from the first day itself when they were bundled out for 135, but the batsmen had a chance to make amends in the second innings. However, for the second time, they got off to starts but were unable to capitalise on them. Abhinav Mukund (59), Virat Kohli (45), Shreyas Iyer (49), Naman Ojha (30) and Baba Aparajith (30) should have carried on but wickets at crucial junctures dented the team's chances. The teams will be joined by South Africa A for a one-day tri-series. Brief scores: India A 135 & 274 in 88.3 overs (Abhinav Mukund 59, Virat Kohli 45, Karun Nair 31, Shreyas Iyer 48, Naman Ojha 30, B Aparajith 30; Gurinder Sandhu 4-76, Steve O'Keefe 4-88) lost to Australia A 349 in 107.5 overs and 62/0 in 6.1 overs (Cameron Bancroft 21 n.o., Usman Khawaja 41 n.o.) by ten wickets.